Now Hiring Licensed Massage Therapists. Please fill out our online form and attach your resume for consideration. Interested in booking any of our bodywork sessions? Well you can easily do so by clicking on the "Reserve Now" tab above. If you plan to enjoy the rest of our facilities at The Springs, we encourage you to make a separate reservation by clicking on the "Soak Reservations" tab at the top of our page. Please keep in mind that The Springs has a 12 hour cancellation policy on all bodywork reservations. We do not charge your credit card at the time of booking. However, if we are not notified of any cancellations 12 hours prior to your scheduled booking, credit card charges will be incurred for the full price of the bodywork session. Therapeutic massage offers a combination of massage modalities to work on the specific needs of your individual body. Techniques may include alleviation of tension, stretching and manipulation of deep tissues. Regular massage will help to improve relaxation, flexibility, and range of motion. 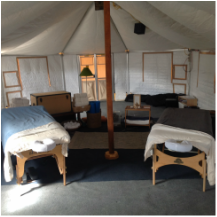 The Springs offers couples massage every Wednesday and Friday evenings beginning at 5 pm. A Couple’s Massage will enhance your Springs experience. It’s designed to be shared with a significant other, or simply enjoy some bonding time with a best friend while indulging in side-by-side services. This transformative bodywork commonly known as Water-Shiatsu is performed in warm water and can allow relief from physical and mental stress as well as being therapeutic for many challenging conditions. As you are supported by flotation devices, our practitioner activates pressure points on the body to promote deep relaxation.